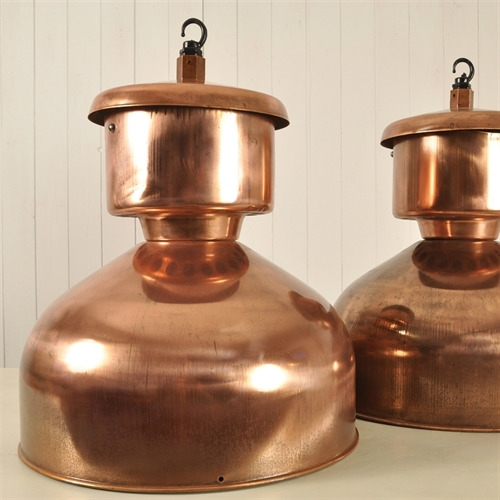 Copper Plated Industrial Pendants - Original House – Decorative Antiques, Vintage Industrial Furniture and Lighting, Cotswolds. A new idea for us. We have taken some mid century vintage enamel industrial lights and had them sand blasted and then copper plated. We are really pleased with the results and will be shortly installing some of these into a project at home. The copper plating, produces a wonderful non-uniform finish - creating an interesting patina, as per the pictures. New E27 bulb holders and supplied with black braided flex, chrome or brass chain and ceiling hook. 55 cm h x 42.5 across the base. These are currently sold - plenty more available with a lead time.